Guest post from Sabine Schut-Kery. Sanceo is finally settling back in at home after our amazing trip to Europe! A huge thank you to United States Equestrian Federation (USEF) and USET for this opportunity to the U.S. riders! Jenny Van Wieren Page, Hallye Griffin, and Dr. Mitchell, thank you for taking such good care of us and our horses! The support from everyone on this trip was incredible and everyone was in great Team Spirit and made this trip so fun! Robert Dover and Debbie McDonald, you both rock as always. Thank you for sharing your knowledge, experience and encouragement! I learned so much in so many ways! I am beyond thrilled that Sanceo and I made it on the U.S. Team for the upcoming Pan Am Games in Toronto. There is a whole team behind this that I am so grateful AND thankful to. Dr Mike Heitmann AND Alice Womble and everyone at Horsegate Ranch, you have believed in us from the very beginning! Carmelin Zavala, the best groom ever, who has cared for Sanceo since he came to me as a three-year-old. Jackie Rogers and Angela Garfinkel, for keeping everything organized at home! My long time coach, trainer and friend Christine Traurig, who has guided us every step along our journey! My vet, farrier and physical therapist, who keep Sanceo in world class condition! A heartfelt thank you to Samira and Claudia, who helped me with Sanceo during this trip and in Munich and Achleiten! Steffen Peters and Johann Hinnemann Krüsterhof Hinnemann, who shared their valuable knowledge and insights during training sessions while we were at Gut Ising! Thank you also to my sponsors, who enable me to provide the very best care and equipment for my horses and myself: Barbara Horseandrider, Samshield America, Grand Meadows, LUXE Heavenly Bodies, Custom Saddlery, MDC Stirrups and Hermes of Paris! I have so many more friends who have touched my life and encouraged me along the way. I hope you know how much I appreciate you! Here are some more pics from our last show in Achleiten. Grand Meadows VIP rider and Pan American U.S. Dressage Team Gold Medalist Heather Blitz partnered with Oak Hill Ranch’s seven-year-old Danish Warmblood Approved Stallion Ripline (Hotline x Blue Hors Cavan) in back-to-back wins at the HITS Saugerties Show, May 16 to 17, 2015. Blitz, who is based in Medfield, MA during the summer, has been showing Ripline since he was four years old. They began the weekend by winning the Prix St. Georges from 16 starters with a score of 71.57%, followed by the Developing Prix St. Georges with 73.01%. We are very proud to have Dani Sussman as a long-time customer and VIP Sponsored Trainer on our Team! 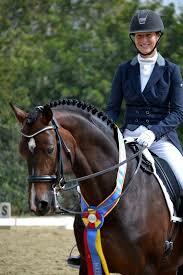 Dani Sussman has more than fifteen years of experience in Eventing, Dressage, and Hunter/Jumpers. Her main focus is on training competitive equestrians and young horses to be top-tier Eventing competitors. Dani’s professional equestrian career began in Northern California, where she first started working as a trainer and coach and where she became a respected rider and instructor. As a Pony Club “A” graduate and because of her love for Pony Club, she was very active with many clubs in her area and did ratings through the C2 level. Dani then moved to Washington State, where she trained with two-time Olympian, Amy Tryon. For four years, Dani traveled with Amy across the U.S. and England, riding and grooming for the top event rider. In 2013, Dani relocated to Larkspur, Colorado, and purchased the stunning 37-acre property where she now runs her own riding and training business, Aspire Eventing. Qualification selection for the United States Big and Small Tour that will head to Europe for the Pan American Games is close at hand. We want to congratulate our sponsored rider, Sabine Schut-Kery, who is one of the top ranked Prix St. Georges/Intermediate 1 combinations, riding Sanceo and currently seated in third in the selection rankings. The rankings of the top four Big Tour combinations will hold their positions and not change by the last qualifying competition – the Golden State Dressage CDI3* in Rancho Murieta, California this upcoming weekend as none of the top four contenders are competing. With just days to go for qualification for the United States Big and Small Tour combinations to head to Europe to select the team for the Pan American Games, all but a few of the highest scoring eight riders and horses are decided. The rankings of the top four Big Tour combinations are almost certainly not going to be changed by the last qualifying competition – the Golden State Dressage CDI3* in Rancho Murieta, California this weekend – as none of the contenders are competing. Allison Brock of Wellington, Florida and Rosevelt, 13-year-old Hanoverian stallion owned by Claudine and Fritz Kundrun with an average of 72.440. Kasey Perry of Orangevale, California on Goerklintgaards Dublet, 12-year-old Danish Warmblood gelding owned by her family with an average of 71.711. Charlotte Jorst of Reno, Nevada on Kastel’s Adventure in sixth place on 71.046, and Elizabeth Ball of Encinitas, California on Avanti in the seventh spot on 70.974, are competing this weekend with the aim of earning scores high enough to put them in the top four. Congratulations to Amanda Johnson, who not only just completed her Trainer’s credentials, but also took High Point, riding Diego Del Rey at The CDS Pomona Spring Fling show with a score of 69.688%. Go, Amanda! Amanda is a remarkable young woman who is disciplined, intuitive, creative, intelligent and highly motivated. Amanda works as an intern for Grand Meadows – we are proud of her accomplishments and glad to have her on our team! Comments Off on Your Horse Did What?